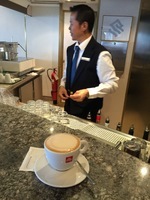 I had sailed on the same ship from Beijing to Hong Kong 20 years ago. And we sailed on the Silver Shadow from Vancouver to Alaska to San Francisco. 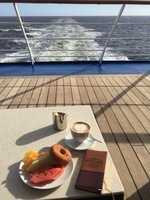 Silversea fares include specialty coffees, standard alcohol, and tips. On their expedition ships - it includes off shore excursions - and some include a rt flight to the port of Ushuaia; and parkas suitable for Antarctica, backpacks, and water bottles. So when I read that the Silver Cloud was being refitted into an expedition ice class ship - it was a no brainer and I booked far in advanced to assure us a midship cabin without a verandah on its maiden voyage to Antarctica via the Falklands. The owner of the company came on board and wished us well. Quite impressive. Because the ship goes to Antarctica it takes a maximum of only 200 passengers plus crew. The ship used to take over 300 on luxury cruises. A huge plus for us who avoid ships that can carry over 400 passengers plus crew. We also prefer the understated tasteful decor to the glitz and gild of other luxury cruise lines. My two complaints of the ship: 1) Need more self service washing machines. 2) The ventilation system did not work properly- the cigar room filled with smoke and I could smell cigar smoke in the public stair well. It&apos;s hopefully fixed by now. Our cabin was on the same floor as the self-service laundry that was available. We had most of our breakfasts as room service - as we were watching our weight and avoided the buffet. Dining: The soy cappuccinos were perfect. Illy coffee. 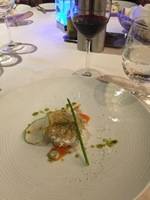 Cuisine slanted towards the European palate - not too much sugar or fat. Flavours were not "in your face." A buffet breakfast and lunch available in The Terrazza. The buffet was never messy and always replenished with fresh food. In fact, on The Silver Shadow - the first breakfast buffet had as much fresh fruit as the last one 10 days later. Did not try the breakfast in the Main Dining Room. We enjoyed the afternoon tea. Homemade pasta everyday. Meats and cheeses from Italy and France. We tried the small French restaurant, La Dame that costs an extra $60 pp. It was nice for one evening. The Grill - enjoyed grilling our seafood and meat on a hot lava rock for dinner - reservations recommended. The Main Dining room did not need reservations - there was always an option to sit with the expedition crew and other guests there. Portions were perfect - not huge. Some ordered two main courses with no problems. Wine list was fine. They do offer a wine list at an extra reasonable cost. With 5 dining options - we never tired of the food. The only complaint I have with the food - is that I wish they stocked better yogurt. Argentina has beautiful buffalo milk yogurt and regular yogurt. Entertainment and Activities: Due to weather delays - we were impressed with the last minute shows they brought on board: In Buenos Aires Tango Show for 30 minutes was perfect. As well as a Gaucho show in Puerta Madryn, Northern Patagonia - when we docked an extra night. We did not attend any lectures by expedition staff but there was a good selection. We did not use the gym as we were on holiday. When the ship remained in port unexpectantly - daytime excursions were added at the last minute: whale watching and town tours. There are choices of off shore excursions for all fitness levels . 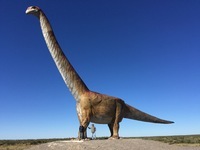 I enjoyed the short hike and looking at fossils in Northern Patagonia. DRESSCODE Surfed the internet and blogs for any hints as Silversea failed in this area. The Ship to Shore traveller - which supplies the complimentary parkas - provide a good list on what to pack for the expeditions and everyday wear. Evening dress code was more difficult to decipher. So this is what I learned from our experience: At the Expedition level - dress code is smart casual. Definitely no jeans for evening dining. My husband wore chinos. Some men ate in La Dame without a jacket. Tie is not needed. I only packed one cocktail dress. Women - do not pack heels - not appropriate on any expedition cruise. There were some guests in polar fleeces - as packing for warmth is essential and I did not see any guests being refused a table due to dress code in the Main dining room. Service was excellent - never told "no." Always so helpful. The one complaint I have is the photography room. Photography tutorials cost extra. That is one room that I found no need for. And yet it took up a lot of space on the ship. I wish that there were computer terminals we could use for internet access instead - as we don&apos;t travel with laptops. Fortunately I had an iPhone. But would have preferred a terminal. From the brochure it looked like they would have some available in the library - but we discovered on board that it was not the case. It was a great disappointment. The Souvenir shop was adequate. I wish I could comment on the Zodiacs - but our expedition cruise was cancelled due to the ship. (Maybe we would have then used the photography expertise.) We were on the maiden expedition cruise that did not make it to the Falklands or Antarctica - and only sailed as far as Puerta Madryn. So instead of 16 days on the ship - it was only 7. And since that experience - we will only cruise with Silversea. Yes - only Silversea. They handled the cancellation way beyond all of our expectations. And that speaks the loudest for any review of a cruise company. How does a company look after you when something major like that happens? (And it&apos;s a bucket list trip.) Within 24 hours of being told to place our luggage outside our rooms for disembarkation - they shifted around 200 passengers from Puerta Madryn on to flights to Buenos Aires and into 4 - 5 star hotels there and booked on flights to our starting points. In our case: the South Island of New Zealand. They reimbursed us for the amounts promised - including a per diem while in transit - within two weeks of being back home. The saddest part was saying good-bye to the other passengers whom we would have enjoyed zooming with in zodiacs. And I can honestly say that we really enjoyed them. The biggest difference between luxury and expedition cruises is that the expedition passengers have signed up for adventure. Women were comfortable to not wear make up. We have rebooked another cruise on the Silver Cloud Expedition. And I&apos;m sure we will sign up for many more. I had sailed on the same ship from Beijing to Hong Kong 20 years ago. And we sailed on the Silver Shadow from Vancouver to Alaska to San Francisco. 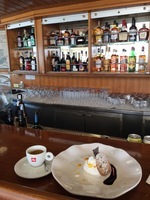 Silversea fares include specialty coffees, standard alcohol, and tips. On their expedition ships - it includes off shore excursions - and some include a rt flight to the port of Ushuaia; and parkas suitable for Antarctica, backpacks, and water bottles. So when I read that the Silver Cloud was being refitted into an expedition ice class ship - it was a no brainer and I booked far in advanced to assure us a midship cabin without a verandah on its maiden voyage to Antarctica via the Falklands. The owner of the company came on board and wished us well. Quite impressive. Because the ship goes to Antarctica it takes a maximum of only 200 passengers plus crew. The ship used to take over 300 on luxury cruises. A huge plus for us who avoid ships that can carry over 400 passengers plus crew. We also prefer the understated tasteful decor to the glitz and gild of other luxury cruise lines. 1) Need more self service washing machines. 2) The ventilation system did not work properly- the cigar room filled with smoke and I could smell cigar smoke in the public stair well. It&apos;s hopefully fixed by now. Our cabin was on the same floor as the self-service laundry that was available. We had most of our breakfasts as room service - as we were watching our weight and avoided the buffet. Dining: The soy cappuccinos were perfect. Illy coffee. 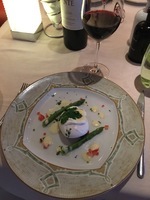 Cuisine slanted towards the European palate - not too much sugar or fat. Flavours were not "in your face." A buffet breakfast and lunch available in The Terrazza. The buffet was never messy and always replenished with fresh food. 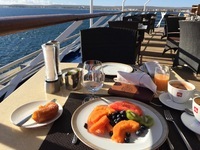 In fact, on The Silver Shadow - the first breakfast buffet had as much fresh fruit as the last one 10 days later. Did not try the breakfast in the Main Dining Room. We enjoyed the afternoon tea. Homemade pasta everyday. Meats and cheeses from Italy and France. We tried the small French restaurant, La Dame that costs an extra $60 pp. It was nice for one evening. The Grill - enjoyed grilling our seafood and meat on a hot lava rock for dinner - reservations recommended. The Main Dining room did not need reservations - there was always an option to sit with the expedition crew and other guests there. Portions were perfect - not huge. Some ordered two main courses with no problems. Wine list was fine. They do offer a wine list at an extra reasonable cost. With 5 dining options - we never tired of the food. The only complaint I have with the food - is that I wish they stocked better yogurt. Argentina has beautiful buffalo milk yogurt and regular yogurt. Entertainment and Activities: Due to weather delays - we were impressed with the last minute shows they brought on board: In Buenos Aires Tango Show for 30 minutes was perfect. As well as a Gaucho show in Puerta Madryn, Northern Patagonia - when we docked an extra night. We did not attend any lectures by expedition staff but there was a good selection. We did not use the gym as we were on holiday. When the ship remained in port unexpectantly - daytime excursions were added at the last minute: whale watching and town tours. There are choices of off shore excursions for all fitness levels . 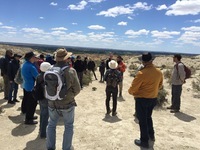 I enjoyed the short hike and looking at fossils in Northern Patagonia. Surfed the internet and blogs for any hints as Silversea failed in this area. The Ship to Shore traveller - which supplies the complimentary parkas - provide a good list on what to pack for the expeditions and everyday wear. At the Expedition level - dress code is smart casual. Definitely no jeans for evening dining. My husband wore chinos. Some men ate in La Dame without a jacket. Tie is not needed. I only packed one cocktail dress. Women - do not pack heels - not appropriate on any expedition cruise. There were some guests in polar fleeces - as packing for warmth is essential and I did not see any guests being refused a table due to dress code in the Main dining room. Service was excellent - never told "no." Always so helpful. The one complaint I have is the photography room. Photography tutorials cost extra. That is one room that I found no need for. And yet it took up a lot of space on the ship. I wish that there were computer terminals we could use for internet access instead - as we don&apos;t travel with laptops. Fortunately I had an iPhone. But would have preferred a terminal. From the brochure it looked like they would have some available in the library - but we discovered on board that it was not the case. It was a great disappointment. The Souvenir shop was adequate. 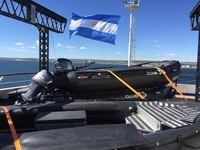 We were on the maiden expedition cruise that did not make it to the Falklands or Antarctica - and only sailed as far as Puerta Madryn. So instead of 16 days on the ship - it was only 7. And since that experience - we will only cruise with Silversea. Yes - only Silversea. They handled the cancellation way beyond all of our expectations. And that speaks the loudest for any review of a cruise company. How does a company look after you when something major like that happens? (And it&apos;s a bucket list trip.) Within 24 hours of being told to place our luggage outside our rooms for disembarkation - they shifted around 200 passengers from Puerta Madryn on to flights to Buenos Aires and into 4 - 5 star hotels there and booked on flights to our starting points. In our case: the South Island of New Zealand. They reimbursed us for the amounts promised - including a per diem while in transit - within two weeks of being back home. The saddest part was saying good-bye to the other passengers whom we would have enjoyed zooming with in zodiacs. And I can honestly say that we really enjoyed them. The biggest difference between luxury and expedition cruises is that the expedition passengers have signed up for adventure. Women were comfortable to not wear make up. We have rebooked another cruise on the Silver Cloud Expedition. And I&apos;m sure we will sign up for many more. It was adequate and I liked the walk in closet. There is an extendable clothesline in the shower. I gave it 5 stars because I loved the pillow menu. Sounds a bit hokey at first but the special wheat bag pillow assured me a good sleep - it made a huge difference. It really did.